Secret Beach (also known as Kauapea), isn't so much a secret as it is just a hard beach to get to. Tucked up against high cliff walls, most people above never see the beach below and even if you're looking for it, the trailhead is unmarked and a little hard to find. Once you do, it's also a bit of a hike down a fairly steep and long trail that turns into a terrifying slippery slide when it's wet. Once down and finally on the sand, it's worth it. You'll want to keep it a secret. The beach is long, wide and stunningly beautiful. Golden sand interrupted with numerous black rock outcroppings, tide pools, and even a small stream or two make this an interesting beach to explore. You won't be able to decide which way to go. To the west you'll find lava rocks, tide pools, and even a waterfall if you go far enough - wading through low spots and scrambling and climbing over high spots as you go. On the south end of the beach you have a wonderful view of Kilauea Lighthouse. The waves here can get big and are fun to watch, but strong currents and rocky shorebreaks can make going in the water precarious. Even if you're a strong swimmer be sure to study the currents and ask the locals before going in the water. Directions to Secret Beach: From Kilauea, drive north 1/2 mile and turn right onto Kalihiwai Road (which immediately elbows left). Then immediately turn right again onto Secret Beach Road (this road is unmarked and rises up between an 8 foot berm on each side). In less than a half mile you'll come to the end where there is a small parking area in front of a few homes. Look for the trailhead between the houses. From here the trail is a 5 minute or so walk down a very steep trail on the left side of a draw next to a fence. If it has been raining, this trail can be very muddy and slippery. Come back when it's dry. Note: If driving from Princeville turn left on the second Kalihiwai Road after crossing Kalihiwai Bridge. 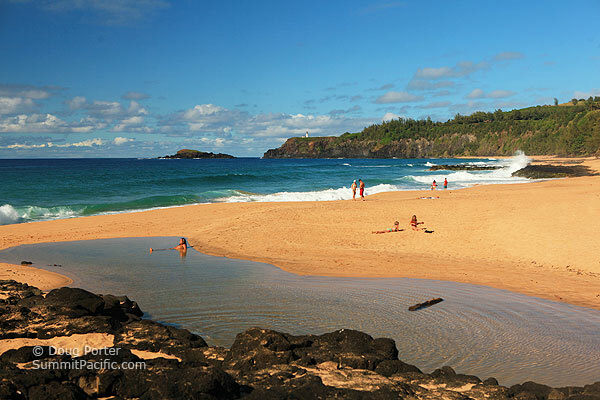 See our list of beautiful Kauai Beaches.